Update 4/17/18: The commit has been merged. This means the feature will likely be available in Android P Developer Preview 2. Bluetooth is a critical part of smartphones. The technology makes things such as Bluetooth headphones and earphones, Bluetooth keyboards, Bluetooth gaming controllers, etc, possible. Android has received many improvements to improve the Bluetooth user experience on Android smartphones. The improvements are doubly important when considering the fact that many flagship smartphones are opting to skip the 3.5mm headphone jack, thus necessitating either the use of adapters or Bluetooth wireless headphones/earphones. However, that doesn’t mean that the Bluetooth experience on Android is free from flaws. In fact, even the most recent version of Android in the form of the first Android P Developer Preview continues to suffer from an inability to remember Bluetooth device volume levels on a per-device basis. Currently, Bluetooth volume levels remain the same for different devices. This can result in users getting startled if they keep the volume for some Bluetooth A2DP devices at high volume levels while using other Bluetooth devices at lower volume levels. 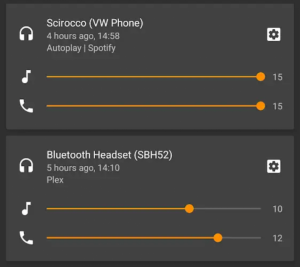 As Android currently doesn’t automatically remember Bluetooth volume levels for a particular Bluetooth device, users have to remember to manually adjust the volume or take care not to listen to music at extremely high volume levels. The commit states that Bluetooth volume is now handled on a per device basis, with the volume being stored in a shared preference. The volume is loaded every time the A2DP device is active. It should be noted that the commit hasn’t been merged yet, but it likely will be. Once it has been merged, Android P will provide an effective quality-of-life solution to a flaw that currently exists when using multiple Bluetooth A2DP devices with the same phone. If you would rather not wait, an app on the Play Store named Bluetooth Volume Control implements this functionality for any Android 4.4 and above device. It allows users to individually adjust the timing and configuration for each Bluetooth device.